On a bad day, I would cringe and wonder, in this day and age when even the most exotic of cooking tools can be purchased online, what would be the excuses for not investing in such tools if the success in creating one’s favorite dishes depends on them? But on a good day, I tell my sometimes impatient, self-righteous self to shut the heck up. True, the tools may be more readily available these days, but there are issues of shipping costs (would anyone care to calculate how much it costs to ship a granite mortar across the country? ), storage space, etc. Besides, I am a trouble-shooter by nature. The process of figuring out creative solutions to a problem thrills me to no end. Macgyver is my kitchen patron saint. Well, guess what. Today’s one of those good days. Those who have never been to Thailand may not be aware of the fact that what is featured here is only one of the many versions of Som Tam (ส้มตำ)* or Thai green papaya salad (most often transliterated Som Tum which is linguistically messed up or Som Tom which is wrong in multiple levels). This more “friendly,” peanutty version happens to be the most prevalent one outside of Thailand. There are also some that are made with vegetables other than green papaya** (which, strictly speaking, is a fruit). And some are made entirely out of fresh fruits. I needed to get that out of the way lest anyone think that this version of Som Tam is the definitive version. I also need to talk about one other thing before going into the recipe. (Please know that I’m not wasting your time with these little tidbits of background information; I actually have a point.) It should be noted that the “Tam” in Som Tam means “to crush” or “to pound” — a verb that is most commonly used when a mortar and a pestle are involved. “Som Tammade without a mortar and a pestle,” therefore, is oxymoronic. 1. 6 ounces of green papaya strands – To make green papaya strands, peel a green papaya (choose one that’s really, really firm and doesn’t yield easily when pressed with your thumb) and shred its flesh with this incredible tool that holds the universe together – the Kiwi shredder. There is a very inexpensive handy dandy shredder which is much more affordable. 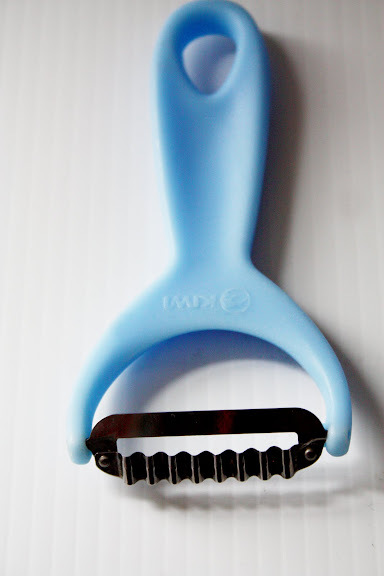 Or you can go for the more expensive brand – Kiwi Pro-Slice Thai Peeler . 1. 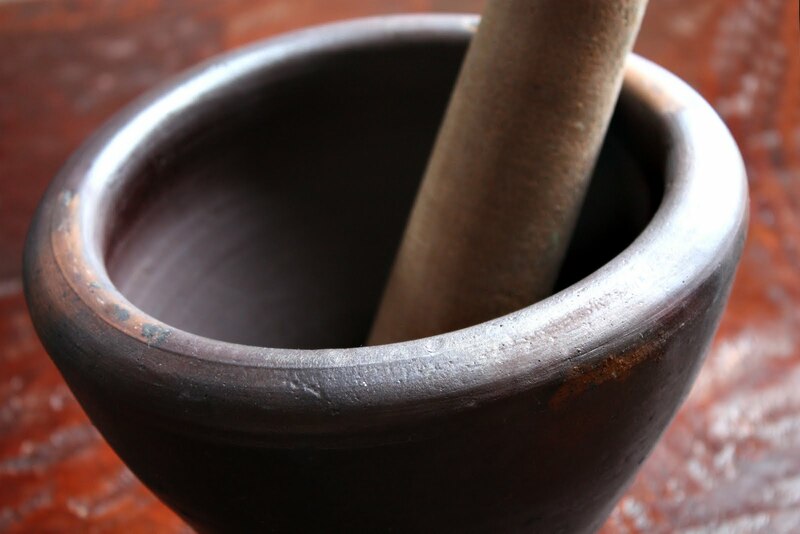 Choose the right kind of mortar and pestle to avoid 1. producing a DOA Som Tam and, 2. an appearance of cluelessness. 2. Pound the garlic and chilies until they form a smooth paste. 3. Add the dried shrimp and pound until the pieces are broken up, but not completely pulverized. 4. Add the palm sugar (sometimes it is hardened and needs to be chopped into little pieces before being used in a recipe), maybe 2-3 teaspoons at first. You can always add more. The reason we’re adding the palm sugar now is because you want to pound it to a paste so that it can be dissolved more easily and blend more readily with the other flavoring agents which will be subsequently added. 5. Add the peanuts and lightly pound until they are broken into tiny pieces, but not to the point where they form a thick paste. 6. Add the green beans and crush them with the mortar until they’re splitting and lightly bruised. 7. Add the papaya and tomatoes and pound on them. This is strategic bruising. You want the papaya strands to soften up a bit so they can drink up the seasonings more readily. You also want to crush the tomatoes so they release their juices and give their flavor and beautiful red hue to the otherwise anemic-looking papaya strands. 8. Add a couple of teaspoons of fish sauce and a couple of teaspoons of lime juice to the mix. 9. Have in one hand a large spoonto help flip things over in and scrape down the sides of the mortar while your other hand pounds away with the pestle. 10. Keep pounding and flipping for a few seconds, just until the content of your mortar resembles Som Tam. Trust me, when you see it, you’ll recognize it. 11. Taste for seasoning. Add more fish sauce, lime juice, or sugar as needed. 1. With a garlic press, or a sharp knife and two skillful hands, mince the garlic into a paste. No chunks, not even small ones. Paste. 2. Place the chillies in a plastic ziploc or sandwich bag, seal the bag, place it on a folded kitchen towel, and pound it into a paste with your weapon of choice: a rolling pin, a baseball bat, or the bottom of a Mason jar. Be brutal. You’ve earned that right. 3. In a separate bag, do the same with the palm sugar. Make sure the sugar is pounded into a paste for better dissolution. Spare it no mercy. 4. 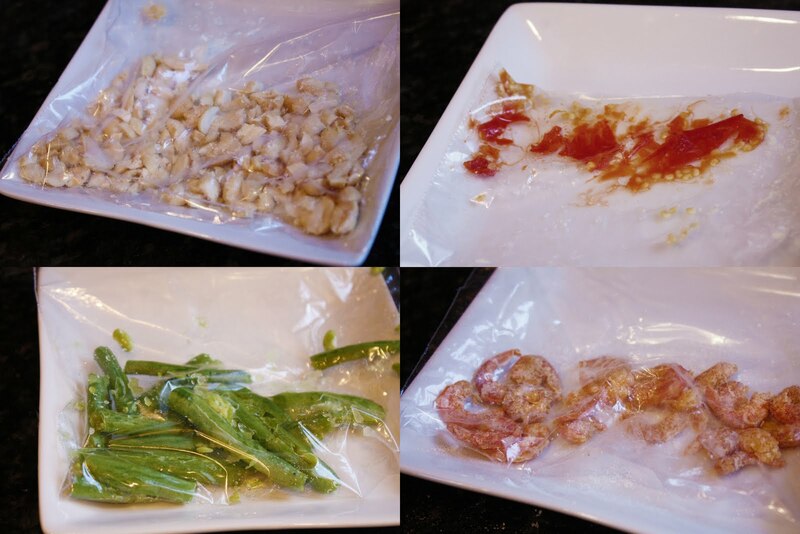 Place the peanuts, green beans, and dried shrimp in one bag and pound them just until the peanuts are broken up, the dried shrimp is flattened, and the green beans are bruised and split up. 5. Place the green papaya strands in a large mixing bowl along with the halved cherry tomatoes. Empty the contents of the torture bags into the papaya bowl. Add lime juice and fish sauce to the bowl (start off with just a little; you can add more). 6. With your eager, murderous, yet impeccably clean hands, mix and squeeze everything together, crushing the tomatoes in the process. With both hands, mix and squeeze, then mix and squeeze some more. Keep squishing until the papaya strands are softened, the tomatoes have released their juices, and everything melds together nicely. This should take a few seconds, depending on how hard you squeeze. 7. Correct seasoning as needed. 8. Trust me. In a side-by-side blind tasting, one will have a hard time differentiating Som Tam made the traditional way and Som Tam made without a mortar and pestle. You have now entered the geeky area. The first syllable, Som (ส้ม) has the same vowel quality of the long ô in “dome” or “Rome,” but is of smaller quantity. Say Rome or dome, but reduce the vowel quantity to half its length. Then replace the R and D with S, keeping the shortened vowel in place. That’s how you say it. As for the tone, the closest thing to the proper tone would be to turn it into a verb in the imperative mood and say it as if you’re making a command, “Som!” That should do it. 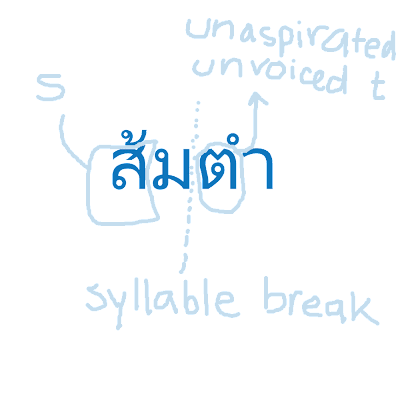 The second syllable, Tam (ตำ) has the same vowel quality and quantity as the word, “come.” Say “come” in the flattest tone possible. Then replace the “c” in “come” with “t.” That’s exactly the vocalization you’re looking for. For extra authenticity, make your “t” unaspirated/unvoiced. Place the tip of your tongue right behind your front teeth (or, in some cases, denture) and make the “t” sound without shooting out a breath of air between your upper and lower teeth as you would when pronouncing the English “t” (especially in the initial position). **Some vegetables have been successfully used as substitutes for green papaya which may not be available in all areas of the world. Good candidates would be vegetables that are crisp, mild- and clean-flavored, not prone to oxidation and can hold their shape well. Carrot (as LimeCake has made it here), cabbage, and daikon work really well. In fact, my favorite Som Tam is made of grated carrots. I like even it better than I do the traditional green papaya. Now that I have mortar and pestle I can try to make this specialty the standard way! The kiwi peeler looks like a great gadget too! The other thing we can’t get in Mexico is green papaya. Not enough demand, hence market failure again. Mexicans eat ripe papaya by the tons here. One cook from another restuarant tried to order her own bacth of green papaya, but on the day she went to pick them up, they all turned out to be ripe. Totally unusable! I also cannot get dried shrimps, nor palm sugar. Furthermore, even if we’re on the same continent, the arms of logistics do not reach efficiently down here. It would cost me a fortune to order anything online, and sanitary regulations probably prohibits me from ordering food products. However, one day I went to one of three Thai restaurants here in Mexico City and the owner/cook had an alternative. She said she discovered this on a visit to Chiang Mai. The substitute she used for green papaya was chayote. In the north of Thailand, it’s called ‘fak maew’ (ฟักแม้ว), the northerners use this for making their own version of ‘som tam’. It works beautifully. Only drawback, the grated chayote needs to be used immediately, can’t be prepared in advance like green papaya, it loses it’s crispiness easily. And to substitute for dried shrimps, this cook uses fresh shrimps slightly sauteed. I bought myself some chayote a few days back. Let’s see if I can replicate the results! I can’t help but wonder how chayote arrived to Thailand and became popular there! Many vegetables and fruits have their origins from ancient america. I used to take it for granted that chilli was always Thai, so wrong…. Try Zucchini (Italian squash) as substitute. Thanks for posting this. Good things do come to those who wait! I did make pad see ew over the weekend with the almost burned bits of goodness. Now I look forward to trying the methods you outline here. This post takes me right back to our recent visit to Thailand, where I had som tam at pretty much every meal. honestly, i do like thai green papaya salad, i even like it better than vietnamese green papaya salad (much better, in fact) but it something that i have never had the inclination to make. why? because that special sour/salty/sweet combination that is virtually impossible to replicate in my kitchen. i’m serious. i don’t want to break my heart when i fail at making this and then be turned off of this dish for.ever. MacGyver is the perfect patron saint for you! I like the idea of the rolling pin pestle, especially the part about being brutal. This sounds like a great dish for relieving stress! 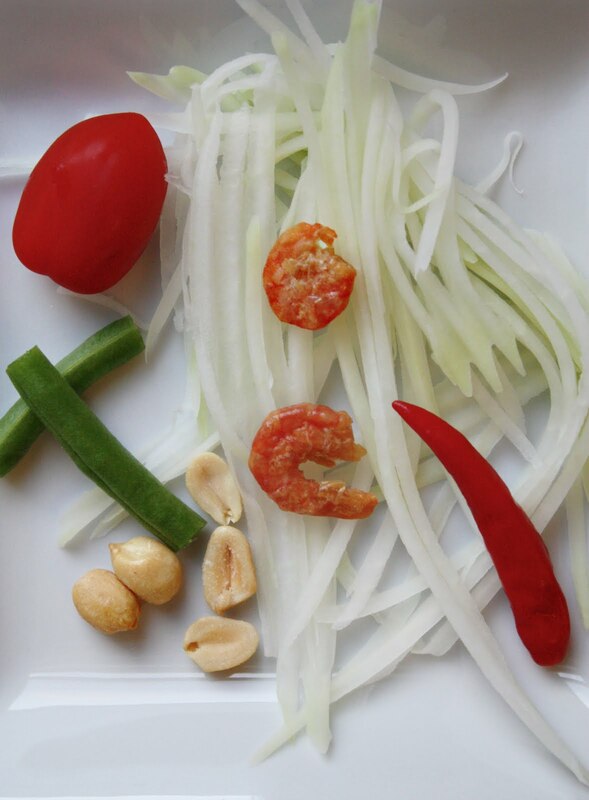 Nice post….the green papaya salad look so refreshing 🙂 Sure a great treat for the Summer! I absolutely love your blog and look forward to each one. As a novice Thai cook I appreciate all your helpful hints. I cannot wait to try this one, it sounds so delicious, mortal and pestle or not, but I want to create this as authentically as possible. 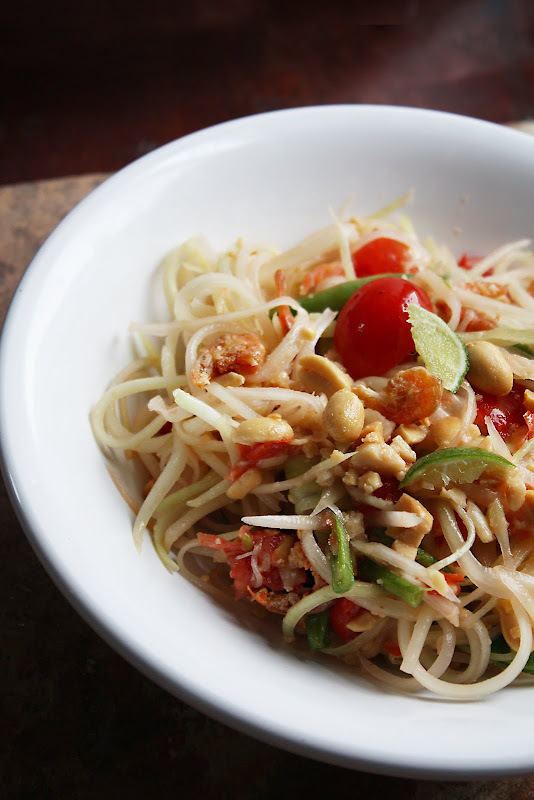 som tam is my absolute favourite thai dish. whenever i’m in thailand i eat it every single day! no kidding. 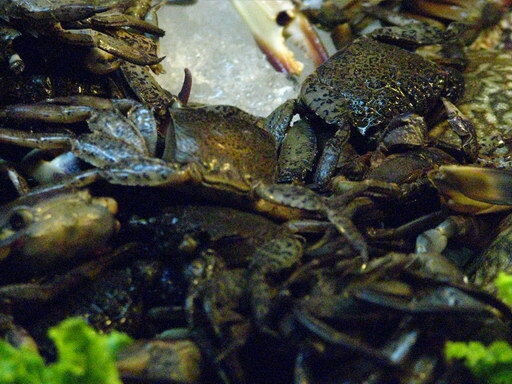 and i love it even more with the crabs. so crunchy and delicious. Michelle – True, hence the explanation in the post on how you should pre-bash individual ingredients then squish them all together until they’re softened and the flavors meld together. I could only giggle when I read your ways to pronounce som tam. But yes I am going to try the recipe. Californians can buy som tam at thai restuarants and it is pretty good. Thank you for this post this is so informative. I have seen it done on TV in a mortar and pestle and never thought that I could recreate without the gadget. Now that you have shown it it makes total sense! I should try this out. Thank you. Jessica – Technically, yes. Green papayas are not only unripe, but they’re picked before they are fully mature too. The skin has a glossy sheen to it and is thoroughly green with no yellowish spots anywhere. The seeds are still tender and white and the flesh so firm that it doesn’t give at all when you press on it hard. The papayas that are sold in most non-Asian stores that I’ve seen are fully mature, even though they are not fully ripe. Best places to get young, green papayas would be Asian supermarkets, especially ones that are specialized in Southeast and/or South Asian ingredients. Just done it, it was terrific! I worked equal fish sauce to lime juice and adjusted the sugar. My father said it was to hot and I already half the chili, I told him without the heat it isn’t worth eating and said that the chili will stop him from over eating so it’s a good thing! Me Like it fiery hot, so as it tastes cold kind of going onto the tongue initially then burns back out the nose!!!! Loved it, thanks for your time and efforts! Just made this…delightful. I used stevia in place of palm sugar to make an already low-carb dish even lower. I figured if there was any dish in the world that could hide the small aftertaste of stevia (some people can’t even detect it, but I can), this would be it. Of course, it’s so concentrated I ended up making it too sweet, but I’ll do better next time. I only had one of the mid-size granite mortars, so I smashed everything in sequence and then mixed in a bowl. I hadn’t seen the point in having a mortar for one dish, but I now see how it’d really be helpful. Leela – Can green papaya be frozen, either shredded or whole? I doubt there is going to be a long window where these are available at my market. Joel – Brilliant! My aunt makes this all the time with powdered stevia from Trader Joe’s which though is not pure stevia (it has lactose in it), it tastes pretty close to sugar and isn’t bitter. Papaya once frozen and thawed loses its original texture. I don’t recommend it. To store grated green papaya for up to 7-10 days in the refrigerator, wrap it up in 3-4 layers of paper towel, place it in a zipper bag, and store the bag in a temperature-controlled vegetable crisper. Finally got myself a good mortar and pestle, and whoah! this was fun. Oddly, I remember not being able to eat Som Tam at first(I practically needed to drink a bottle of water between bites!) But now i can’t imagine leaving out any of the heat – yum – it turned out lovely. Thanks for the recipe and especially for including the “pounding order”! Great post. This is a favorite Thai dish of mine – it’s great to take to barbecues. Love the linguistics/pronunciation section! Also wanted to add . . . I’ve been using this thing: http://tinyurl.com/3bc5ane for shredding and it’s been great. Probably takes up a lot more room than your suggested tool, though. I noticed that in Thailand they frequently add another brown colored liquid. I think it may be some kind of anchovy dressing in addition to the standard fish sauce. Does anyone know what it is ? 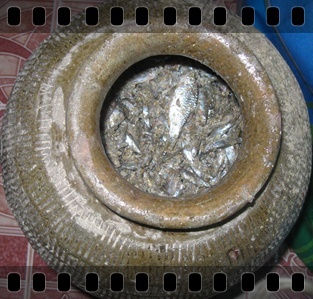 J – That could be nam pla ra – northeastern fermented fish diluted with water with the solids strained out. Thanks Leela – so that’s what it is…most recipes never call for that but I see them adding it all the time in Thailand. Last trip I got the vendor to let me try it with a spoon and I noticed that it wasn’t as overpowering as say anchovies. Can it bought in a bottle…I’ll look out for it in new may wah in the richmond district ? J – Yep. Look for something like this. I’m sorry if you addressed this somewhere, but I was wondering about green mango versus green papaya. The first of these kinds of salads (which are similar to a Westerner even though probably not to you) was a green mango salad in Bangkok, which I loved. And when I then tried som tam at another restaurant in Thailand, it tasted pretty similar to me. Are the 2 fruits interchangeable? I had to laugh, btw, about the mortar and pestle–I spent my honeymoon in Thailand and a granite mortar and pestle was what I wanted most. It was very difficult to find for a clueless tourist, I finally found one at a market on the side of the road in the south. I lugged that sucker everywhere–all the Thai people looked at me like I was crazy! We had to bury the pestle in the luggage as I was concerned it would be seen as a weapon! Of course now I know where to mail order one, but back then I was convinced I had to go to Thailand to get one! Laura – Haha. I probably would have stared at a tourist who schlepps a granite mortar around town too. There’s a green mango version of Som Tam (Tam Ma-muang) which is a much, much less common variation of the dish. The mangoes are prepared and used the same way. You just have to adjust the amount of lime juice to correspond with the tartness of the green mangoes. You know those meat hammers that come in every set of kitchen tools, that most of us have absolutely no use for? Well they make excellent jaggery/palm sugar pounders! The heck with grating the stuff (which is what’s usually called for in Indian recipes) – just pound the living bejeezus out of the stuff! Ought to work excellently well for this purpose as well. 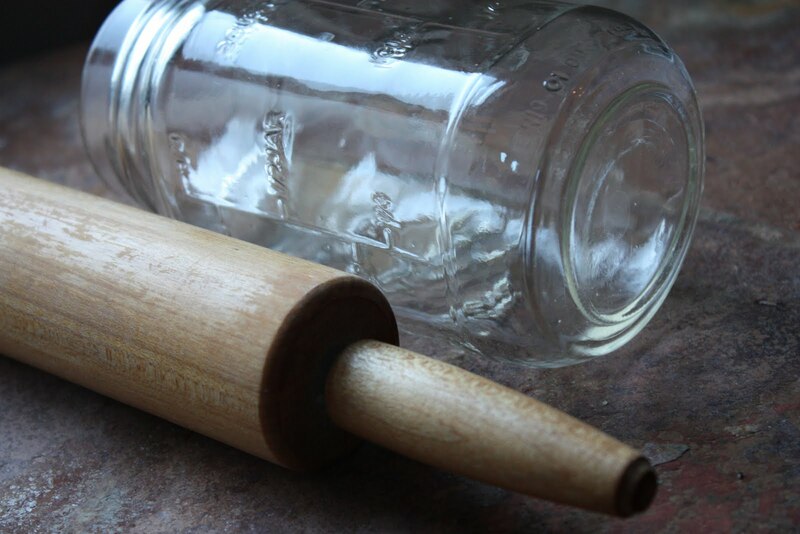 Easier to use (and probably safer) than either a rolling pin or a mason jar (imagine that breaking in your hand!). Just use the smooth side, not the jaggedy side. For 30 years I avoided using jaggery because it was such a pain to grate (even my in-laws grated the stuff). Then one day while I was trying to grate a block of the stuff (and trying not to drip the inevitable blood into it) I just lost it, grabbed the meat tenderizer and started whaling – WHY DID IT TAKE ME SO LONG? LOL! Kitchen Barbarian – Excellent tip. Thank you. Hi Leela! I recently found your site, and oh my goodness, I love it so much! Best of all, we both live in Chicago, which means I can ask you: where do you buy your Thai groceries? Specifically, where do you find green papaya? I tried looking for it in a grocery store in Chinatown but couldn’t find it. If you know anywhere on the South Side that sells green papaya, I would appreciate it if you told me the name and address. Newbia – Thank you. The best area to shop for Thai ingredients is Argyle/Broadway. There are a few Asian (mostly Vietnamese) grocery stores there that have pre-shredded green papaya. Golden Pacific is also a good place to shop for Thai ingredients. Sorry, I don’t know of any place in the South Side. Regarding Thai restaurants, here are some of the dishes I recommend. Many thanks for this friendly recipe – I will now actually try it out! Thanks for the advice! I will make a trip up to Argyle. I already read it and I will definitely be on the look-out for those restaurants. This looks so good, healthy and light. Thank you for a GREAT blog and recipe! I made the som tam for my wife and I tonight. It was a big hit. I made it more spicy than usual, for my wife and I added a bit more palm sugar. The som tam was REALLY delicious, and using a mortar and pestle made the preparation even more fun than it would have been. Would it be heresy if I substituted either small cooked shrimp or chopped larger cooked shrimp for the dried shrimp? I’m thinking in the style of the green mango recipe and I prefer cooked shrimp to dried shrimp, but I’m not anxious to have the Thai cooking gods and goddesses after me! It’s not traditional, but it definitely has been done. I made som tam again, but this time I tried it with carrots. You were right. It’s really good! My wife, an immunologist who teaches aerobics as a hobby, came back from her Saturday class with cupcakes. I wasn’t going to eat cupcakes, and I had just finished playing with our border collie, Loki, so I decided to make som tam again, this time just for myself. I had just picked up some really fresh carrots, being inspired by in your blog from the picture from Krua Apsorn (which look so fresh and shiny they appear to be almost magically delicious)! I tried the Kiwi Pro-Slice Thai Peeler, but I was not having much success making julienne slices out of the carrot. How do you use this tool correctly? My slices were too thick. Fortunately, I also have an OXO mandoline julienne slicer, so I was able to julienne what I needed. The rest I did in the traditional way using a mortar. It was great! I haven’t named my Cuisinart mortar, and I’m going to acquire a second Thai granite mortar and pestle. The right ingredients and equipment is just essential, as is the right technique, which I am still working on. I stuck with dried shrimp. Tomorrow I make penang beef in the rendang style. What beef cuts would you recommend? It takes some practice with the Kiwi slicer. Don’t dig the slicer’s teeth too deep into the surface of the veg. You’ll get the hang of it. For panaeng, I’d go with chuck roast or anything you’d use for pot roast. Boneless beef shank is nice too. I used grass-fed chuck roast for the Penang beef, and it turned out really well! If I wanted to cook it quicker, such as on a week night, do you think there is any chance skirt steak would work, since there is a significant amount of fat in that cut of beef? I started making this recipe with cucumbers several years ago when we had an abundance in our garden. Slice them in half, de-seed (just run a small spoon down the center) and then shred. Let it sit for a while and then you can tip out the excess juice/water. Great recipe, and great blog! Thanks! Google ‘electric mandoline slicer’. Amazon has a few different ones. I have a Kiwi slicer and making mounds of green papaya strips isn’t all that easy with that tool either… Maybe I’m doing it wrong, wouldn’t be the first time. :-/ Well, here’s a way to do it without a Kiwi slicer. Take your regular fruit/veg peeler and remove the skin, next carefully take your chefs knife and whack the papaya (lengthwise along the papaya) making multiple parallel cuts into the surface. Finally take your peeler again and peel the cut surface rendering yourself strips of green papaya. The closeness of the lengthwise cuts will determine the width of the strips, and to some extent their shape and the peeler depth will determine the thickness of the strips. I imagine this is the way it was done prior to the Kiwi type peeler. You can whack away with your cuts and make a mound of strips that look random and rustic or break out the ruler and make em uniform and fancy. I like the amount of control with this method. Enjoy! I’m glad to find this recipe. It’s been a while since I ate som tam in Khon Kaen and I really missed it. Planning to make one in Indonesia but the problem is I wasn’t be able to find fermented crab and fermented fish (Bla rah). But this recipe just give me solution. I’ll try it as soon as I can get the green papaya. Thanks a lot. i spent seven months in Bangkok and am constantly looking for Thai recipes to re-create the wonderful flavors of street food and markets. 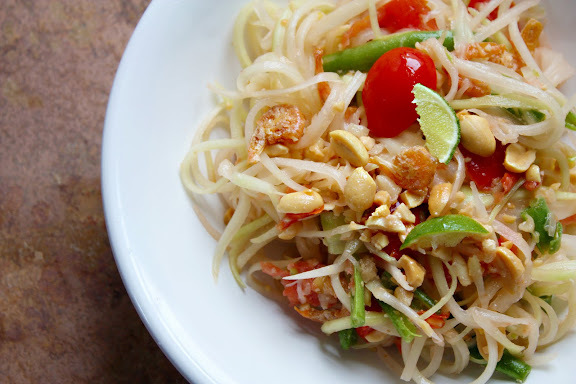 i was ecstatic when i found this recipe- som tam was my absolute favorite food in Thailand! thank you! I made a batch of this for dinner yesterday, but the dried shrimp completely overwhelmed the other flavors in the salad. It would have been great otherwise. Brent – Dried shrimp is one of the key ingredients in this salad; that’s why it’s included here. Having said that, it can be an acquired taste for those unfamiliar with traditional Thai food. You can leave it out. Hi Leela, I’m still not able to reproduce the exact taste of the Som Tam eaten in Thailand. I’m using a som tam pestle and mortar, all the ingredients from the official recipe. The result I’m getting is very honourable (much better than in all the Thai restaurant in Paris), but there is still a very small difference. Very frustrating. So in my quest of a perfect Som Tam, I searched for Nam pla ra, since I noticed as well that in Thailand people were using another sauce than the traditional fish sauce. DIdn’t find it, but I purchased a sauce called Mam Nem (ground fermented fish). Is it the same sauce than Nam pla ra? The Som Tam with this sauce in addition to the fish sauce was good. But the taste of this sauce is quiet powerful, and I’m not sure this is the one used in Thailand. I did a Som Tam in Thailand, using local ingredients including their special sauce, and was able to get the right taste. So I’m wondering if that could simply come from the ingredients that are not as good as in Thailand. Or maybe the only fact that eating a som tam in Thailand will always be better than eating it somewhere else. Hi, thanks for a great recipe with an entertaining description. Also many thanks for the suggested alternative methods. I ended up doing a mixture of methods, since I have a small mortar & pestle. And no dried shrimps, so I substituted with some shrimp paste. But the result was great, definitely something that’s now going on our regular menu. One question… Sometimes one can’t get green papaya. In such cases, what would you substitute it with? In a pinch, my mother uses spaghetti squash for this dish. She cuts it in half and nukes it in a covered dish with a bit of water for 5 minutes. Then she scrapes out the threads with a fork. More watery than papaya but the crunch is still there and easily absorbs the seasonings. I kind of want to go out and buy a mortar and pestle just so I can make this properly. I made this tonight for the first time after having this page bookmarked for over two years, finally saw some green papaya at the market and jumped at the chance to try it. Used the torture bag method, left the shrimp out, turned out fantastic, a big hit ot a pot luck. Thanks so much.